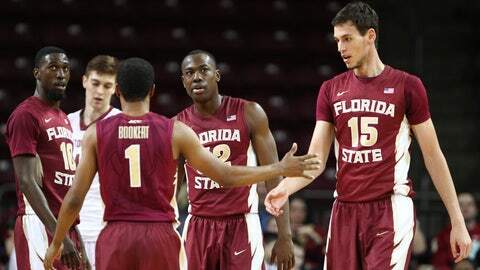 Florida State Seminoles center Boris Bojanovsky (15) and guard Devon Bookert (1) celebrate during the second half. BOSTON (AP) — Aaron Thomas scored 26 points, Okaro White 24 and Florida State pulled out a much-needed 74-70 win over Boston College on Tuesday night. The Seminoles (18-11, 9-8 ACC) posted their third straight victory in their chase for an NCAA tournament berth. Olivier Hanlan led Boston College (8-22, 4-13) with 20 points, but had a key turnover and missed a potential tying 3-point shot in the closing seconds. Patrick Heckmann added 13 points and Joe Rahon, who also missed a 3 in the final seconds, had 11 for the Eagles, who have lost 11 of 14. White hit a turnaround in the lane for the 24th and final lead change of the night, pushing the Seminoles ahead 69-68 with 1:31 to play. After Heckmann lost control of a pass for a turnover, Devon Bookert nailed the second of two free throws, making it 70-68 with 24 seconds left. Following a BC timeout, Hanlan took his eye of an inbounds pass and it went out of bounds off his hip. But Bookert missed the second of two from the line. BC had a shot to tie it in the closing seconds, but Rahon and Hanlan both front-rimmed 3s and Boris Bojanovsky sealed it with one free throw. In a game filled with long possessions, Ryan Anderson’s put-back of Heckmann’s missed 3 had given Boston College a 68-67 lead with just over 2 minutes to play. Thomas’ shot-clock beating fallaway from the right baseline had pushed Florida State ahead 67-66 with 2 1/2 minutes left after Hanlan’s free throw snapped a tie. The lead changed hands 12 times in the initial 10 minutes of the second half before Rahon’s two free throws retied it at 55 with 8:02 to play. After a Florida State miss, Hanlan had a driving one-handed bank shot, pushing BC back in front on the next possession. Heckmann’s 3 right in front of BC’s bench gave the Eagles a 60-55 edge, the largest lead of the game for either team. But the Seminoles scored seven of the next nine points, tying it at 62 with 5:03 left. The teams were tied at 33 at halftime. Neither team held more than a four-point lead in a first half that saw a contrast of styles. The smaller Eagles played mostly zone and had to rely on their 3-point shooting to stay close, nailing 7 of 16 from beyond the arc. After settling for jumpers in the opening minutes of the game, the Seminoles, who played man-to-man, started to get the ball inside and converted a handful of shots in the lane. On most of their possessions, the Eagles tried to slow the game down and ran the shot clock into single digits. There was a stretch of nearly 3 minutes when both teams went scoreless. With BC’s students on spring break, the crowd was much smaller than normal. It also didn’t help that the game tipped off just after 9 P.M. for national TV. The Seminoles close the regular season at home, hosting struggling No. 7 Syracuse on Sunday. BC travels to North Carolina State for its finale, also Sunday.